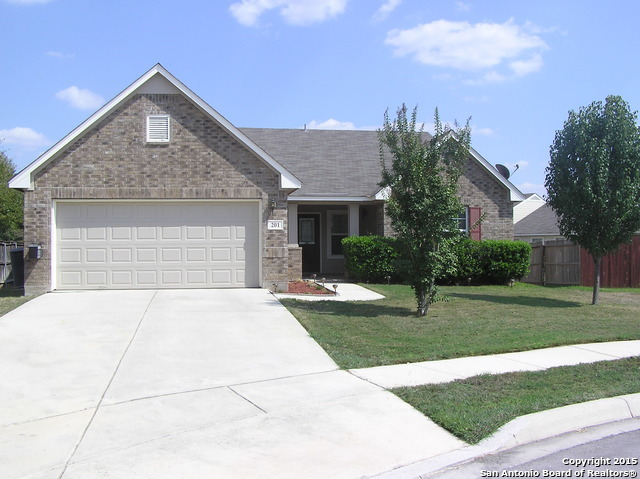 All BENTWOOD RANCH homes currently listed for sale in Cibolo as of 04/25/2019 are shown below. You can change the search criteria at any time by pressing the 'Change Search' button below. "Beautiful stone exterior home in Cibolo. 5 bedrooms/3 full bathrooms with a secondary bedroom and full bathroom on the 1st floor. Island kitchen with plenty of cabinet and pantry storage. Wood floors in the formal dining and family room. Recent carpet (Aug 2017) upstairs in the game room, 4 bedrooms and stairs. Roof was replaced Oct. 2017. Large covered back patio, mature trees, and sprinkler system. Inside HVAC Dec 2016. Close to community pool and play ground. Convenient to RAFB, Ft. Sam"
"Stunning upgrades all around top off this open floor plan! Sitting on an oversized lot on a semi Cul-de-Sac with no backyard neighbors. Walk into the warm entrance with NEW gorgeous engineered wood flooring & all NEW carpet. Second master bedroom on first floor with an En Suite bath. Kitchen features SS appliances. Entertain company at the large granite bar top island or move outdoors to the Texas Lanai Patio and enjoy the spacious backyard w newly stained fence. Magnificent high ceilings on "
"Built in 2008, this Cibolo two-story offers stainless steel appliances, quartz kitchen countertops, master bathroom with separate tub and shower, loft den, and two-car garage. Upgraded features include new carpeting. Community pool, clubhouse, tennis courts, and park are part of the HOA. This home comes with a 30-day buyback guarantee. Terms and conditions apply." "Very nice Bentwood Ranch one story home on cul-de-sac, to include an open floor plan, large living area, breakfast area off kitchen, separate dining area, split master floor plan, mater includes walk in closet, master bath includes separate tub and shower and double vanity, open kitchen with view of large back yard. Easy access to I-H 35, schools, shopping. and RAFB. Across the street from HOA pool, club house and playground. ROOF WAS REPLACED 4-12-19"